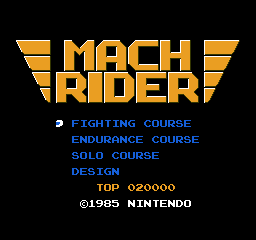 Mach Rider is a “futuristic driving game”, or to explain it more accurately, is a bike-driving game which is set in the future, where Earth has been taken over by evil forces. Your job should you choose to accept it, is to travel from sector to sector, or in this case race through the map, shooting the bad guys and dodging oil and oil cans. 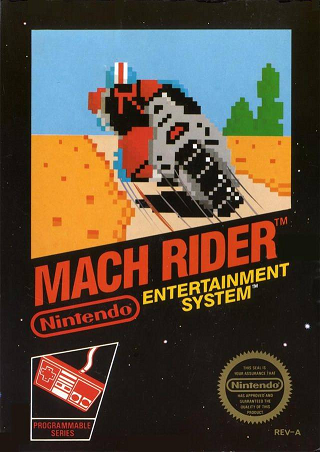 Mach Rider was also a Black Box game initially released on the console’s launch. If you’re unsure what a Black Box game is, then there is lots of information on your favourite search engine however those NES games that are classified as Black Box are distinctive by having by design, erm….Black Boxes. 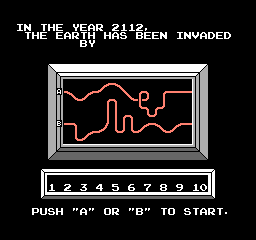 Fighting Course – Similar mode to a story mode, you have to race through 10 different tracks, which you can choose at the start of the race by pressing A for one route, or B for the other route. In this, you have to dodge oil spills, enemies and oil cans which you can destroy, however you can be destroyed yourself, getting split into numerous fragments and put back together again – like a futuristic Humpty Dumpty. If you complete the 10th race, you don’t get some emotional ending, journeying the highs and lows of your experience up to now. You go back to the beginning, to start another 10 rounds. The swines. Endurance Course – You have to race a certain distance in a certain amount of time with enemies and obstacles to slow you down. The swines. Solo Course – See above, but without enemies. The programmer swines. Design Mode – In the same vain as Excitebike you can design you’re own tracks to play on, however outside of Japan if you reset the console then BAM they are lost. In Japan NES users had the Famicom Data Recorder to save their creations on, which wasn’t released outside of Japan. The swines. The controls of Mach Rider are slightly more complex than normal Black Box games however not to the point it get’s difficult or require a PhD to decipher. The A button accelerates, the B button fires your weapon, the up and down d pad buttons change gears up to the fourth gear, and the left and right d pad button moves your bike. Sounds simple enough, but like good racing games the key is control not flat out holding the A button and hoping for the best. You can hammer the B button to destroy the enemies and the oil cans however you will be going faster than the bullets fly from your bike, so more often than not your bike will disintegrate. Graphically, the game looks solid and well defined with different backgrounds depending on the level you are racing. It’s reminiscent of Enduro on the Atari 2600 where every so often the background changes colour, white for example to reflect winter settings or green for a environmentally-friendly level. 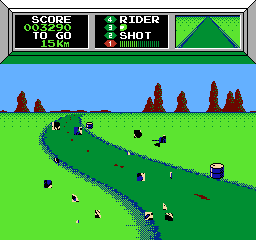 The controls are responsive and feel natural, and feels good that unlike say Rad Racer where you hold the accelerator button and nothing else, you have to change gears which is done in a simple manner and is not of detriment to your gameplay – I mean who would try to accelerate from a stationary position in fourth gear?! Not certain reviewers that’s for sure… You get music at the menu’s and music during the race, which whilst although not memorable it certainly means you don’t need to bring out your Now That’s What I Call Music 50,000 compilation. The sounds effects match the game well and again adds a certain charm to the game.